Trotting towards them were a dozen of the most bizarre creatures Harry had ever seen. They had the bodies, hind legs and tails of horses, but the front legs, wings and heads of what seemed to be giant eagles, with cruel, steel-coloured beaks and large, brilliantly orange eyes. The talons on their front legs were half a foot long and deadly-looking. Each of the beasts had a thick leather collar around its neck, which was attached to a long chain, and the ends of all of these were held in the vast hands of Hagrid, who came jogging into the paddock behind the creatures. 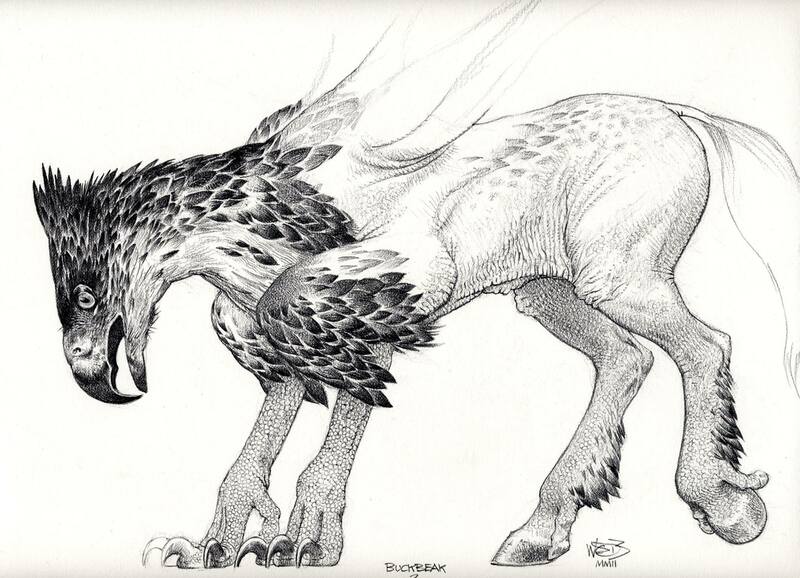 Wayne Barlowe’s early Buckbeak idea, featuring multiple wings and three-hooved hind legs. 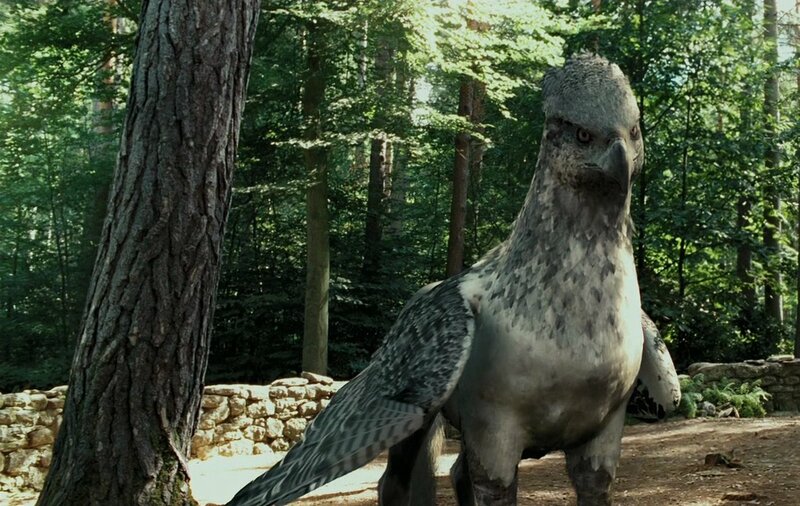 Designing Buckbeak was a task that mainly relied on artistic interpretation. Early concept art by Wayne Barlowe featured multiple wings, as well as smaller toes with hooves on the hind legs and other unusual details. This template was channeled by Dermot Power, who was the key artist in the design process — finalizing the design and providing a colour scheme for it. 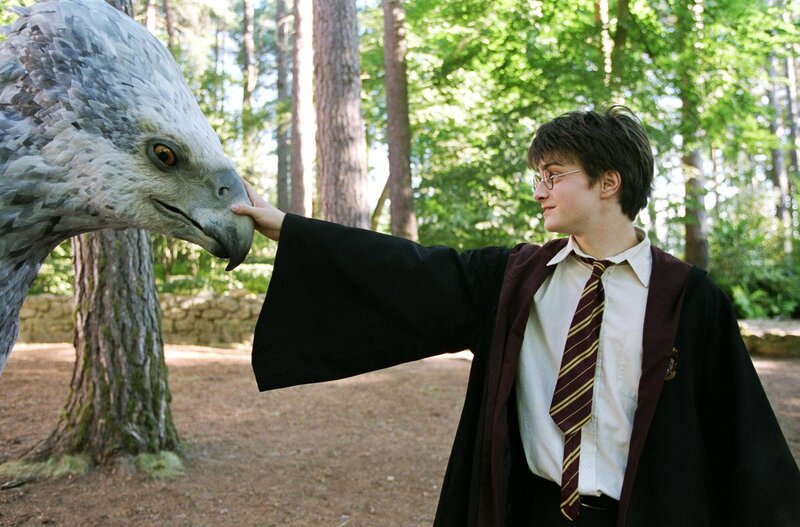 The golden eagle served as the main reference for the Hippogriff’s profile. 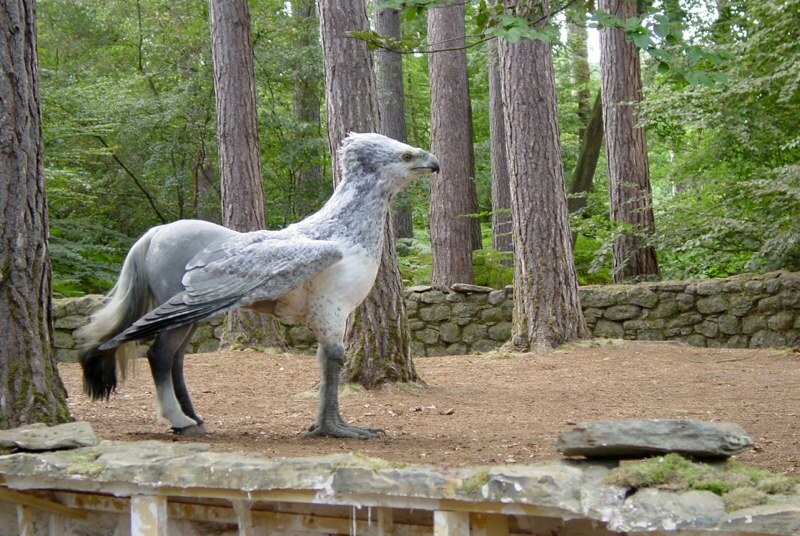 Dudman’s team built three full-scale animatronic versions of Buckbeak for the film — portraying the creature respectively in standing, rearing, and lying down positions. 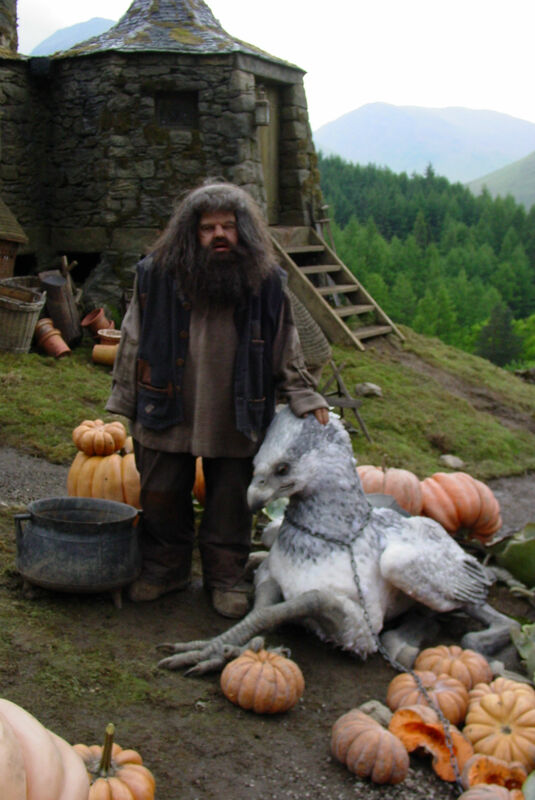 Much like Fawkes for the previous film, the feather work for the practical version of Buckbeak was helmed by Val Jones — who mainly used chicken and goose feathers obtained from the food industry, with the larger ones taken from preserved swan carcasses. Each feather was sterilized, sorted, and bulk-dyed manually, and then airbrushed by hand. The primary wing feathers were instead created wit vacuformed, flocked and airbrushed plastic feather shapes. The feathers were then manually glued to a Powernet jacket, sewn to the puppet’s skin (tailored lycra), laid over internal mechanisms and then fastened with velcro and snap fittings. The animatronics were rigged with an aquatronic system and could perform a wide range of motion. The head was computer-controlled. 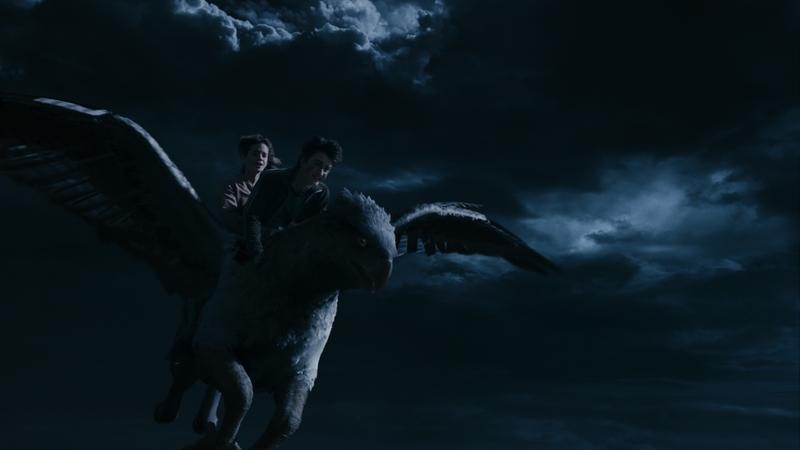 The primary wing feathers were rigged to cables and mechanized to splay as the wings opened and unfolded; the standing hippogriff could spread its wings, and could move its right foreleg and left hind leg, as well as curl its claws. Up to ten puppeteers were needed to operate each one of the animatronics. For scenes set in Hagrid’s property, the lying-down animatronic was mounted on rails, allowing it to slide and be stored inside a tent overnight. Climatic conditions on location (raining, hailing) made shooting the hippogriff extremely difficult — with Val Jones having to clean the feathers from mud and excess water. 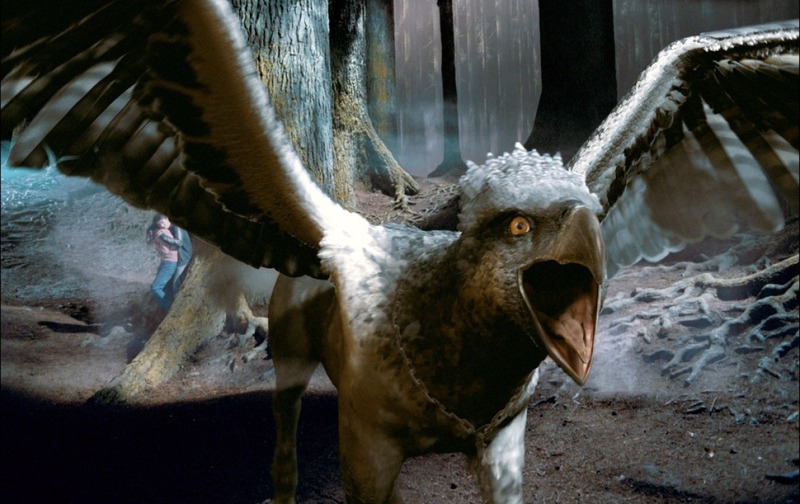 Concurrent to the construction of the puppets was the development of a digital version of Buckbeak, based on Power’s art and stills of the animatronics during construction. 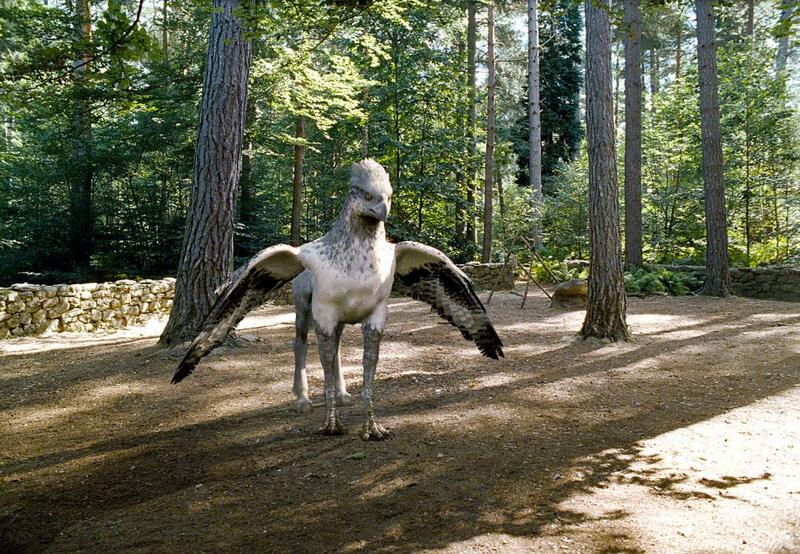 The digital hippogriff was initially intended to be used for walking, throtting and flight scenes. The task was assigned to Framestore (the same visual effects company behind the digital Basilisk for the second film), with a team led by Tim Burke. …was replaced with Framestore’s digital version. 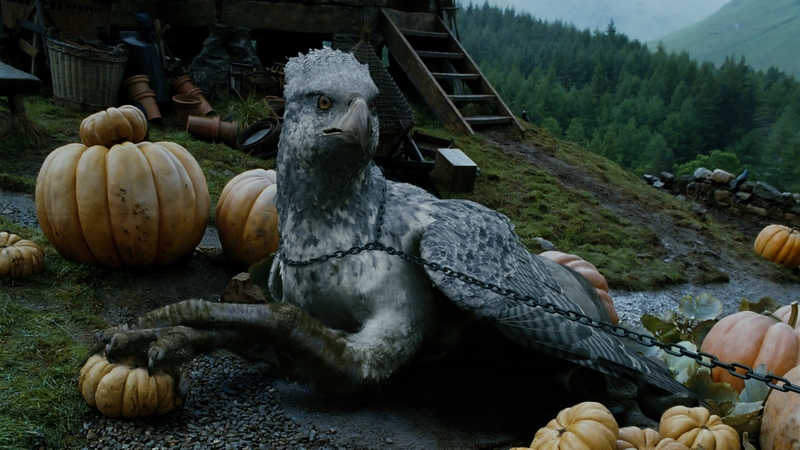 Ultimately, in fact, the animatronic hippogriffs only appeared in two shots, lying down in Hagrid’s pumpkin patch. Otherwise, they only served as on-set lighting and interaction reference. 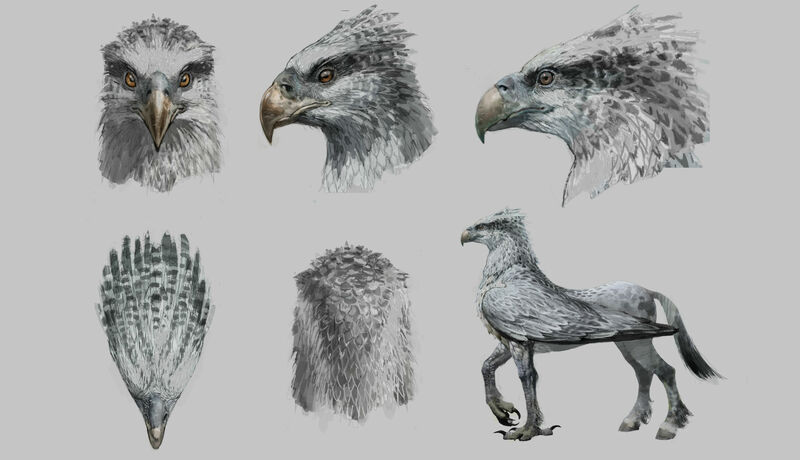 Development of the digital version of the creature mainly involved devising a realistic feather system able to interact with characters and wind resistance. Instead of using a surface with texture maps, the visual effects team decided to model the feathers manually. Development of the feather system began with the deconstruction of the structure of an actual bird feather — from rachis, to barbs, to barbules. 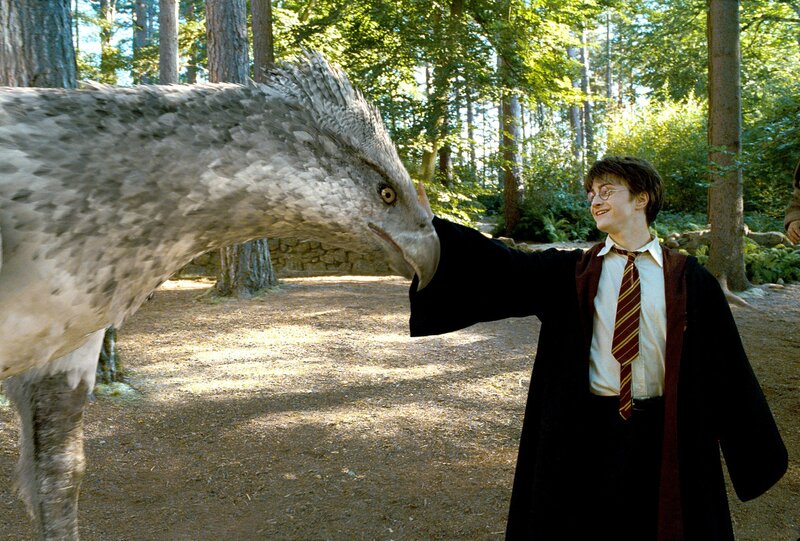 Simulation of barbules was only used when the hippogriff was seen in extreme close-up. 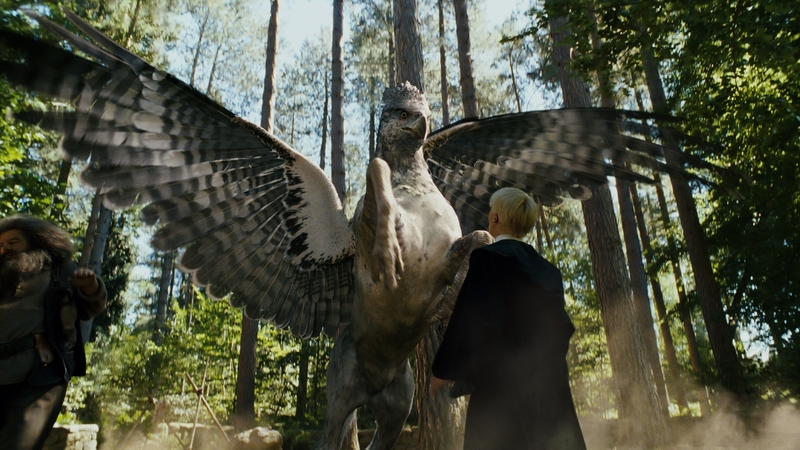 About 16.300 feathers (with 6.7 million individual barbs) were applied on the digital hippogriff’s skin, which was operated by a proprietary muscle system developed in Maya to portray realistic jiggle in the skin. Animation of the wings posed particular issues in that regard, having to employ complex interactions between muscles and feathers. Lomax related: “we wanted a fully opening and closing wing without any cheating. Felix Balbas, our character rigging supervisor, came up with a way of ensuring that primary and secondary wing feathers didn’t intersect as the wings went from fully open to fully closed.” The rig prevented intersections in flattened primary feathers, and a specific program developed for the project resolved intersections and compressed feathers against each other in the closed configuration of the wing. 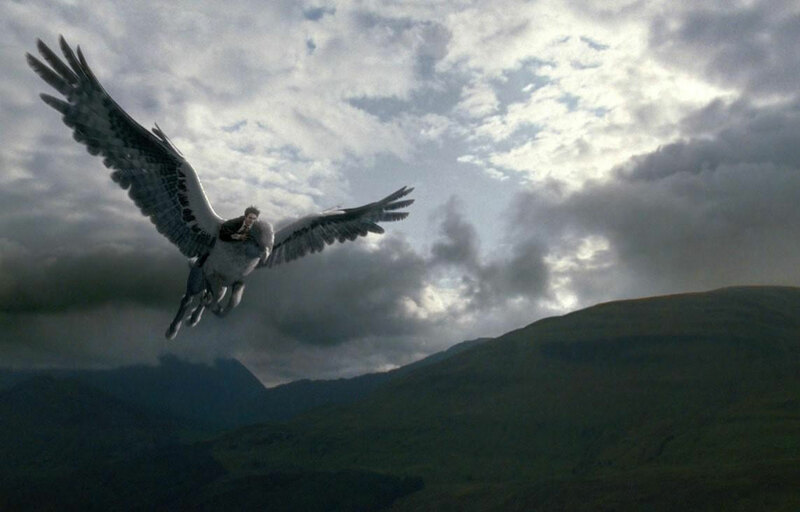 The wing feathers were also scalable, and this function was used when Buckbeak had to take flight. “A 21-foot wingspan just didn’t look magnificent enough, so we settled on a 28-foot open wing,” said Lomax, “but the closed wing extended too far beyond the hippogriff’s back, so we scaled the feathers down as the wings closed.” Buckbeak’s movements were otherwise based on studies of footage of flying eagles, as well as walking and galloping horses. For more pictures of Buckbeak, visit the Monster Gallery. Posted on 13/03/2017, in Movie Monsters and tagged Dermot Power, Framestore, Harry Potter Monsters, Nick Dudman, Wayne Barlowe. Bookmark the permalink. Leave a comment.